Turn your notebook into a MIDI controller. Is there a better alternative to Track Master? Is Track Master really the best app in Author Tools category? Will Track Master work good on macOS 10.13.4? Track Master works only with Magic Trackpad or multi touch-enabled MacBooks. Turn your trackpad into a MIDI controller and use it with your favorite music making applications! Play notes or adjust midi control values with just your fingers. In notes mode, Track Master has the ability to play using multiple scales and keys with adjustable transposition so you can easily play along with almost any song. Track Master can also track up to three fingers at the same time and use their X and Y positions and finger taps for assignable MIDI messages. It's like having three MIDI touch pads in one! 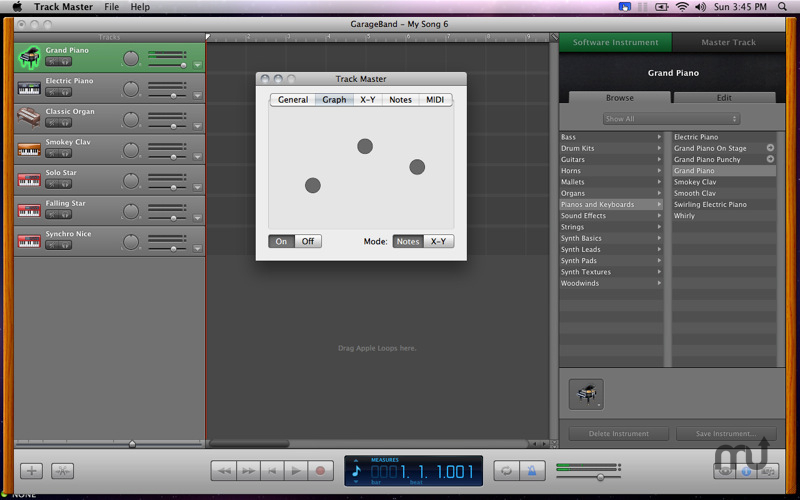 X-Y mode in Track Master works with music programs that allow assignable MIDI controls such as Ableton Live, Logic and Traktor. Note mode will work in any app that allows you to use a midi device to play notes or use note messages as toggle buttons.